Did anybody else see "The Man With The Iron Fists" back in 2012? I bet if you did, you would remember it. Despite being a kung-fu film full of obvious homages, its a movie you'd most likely not forget. How can somebody forget a highly-stylized, kung-fu movie with Russell Crow and Lucy Liu? Or a movie featuring a bad guy with golden armor that resembles a human armadillo? Or a movie where a black guy from America finds refuge in China and builds himself two iron mitts which he uses to pounce the bad guys? Like I said, you'd remember it if you saw it. While its clear why The Academy would never go anywhere near something like "The Man With The Iron Fists," it sure had one thing going for it, fun. I never thought I would see a sequel to "The Man With The Iron Fists," but I was ready to see what RZA had in store for us this second time around. The former Wu Tang Klan emcee wrote and starred in the first film and he did so again for the sequel, also applying some groovy tunes for this second movie too. I was ready and willing to see whatever he put in front of me. RZA has proven he's a capable actor and he actually has some crazy-cool ideas behind the camera as well. 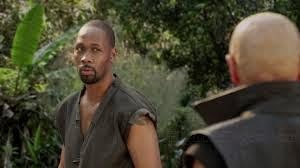 RZA portrays Thaddeus, our hero blacksmith from the first film, is wounded traveling to the Si Fu Village in ninetieth century China. He is found by a local miner Li Kung (Dustin Nguyen) and Kung offers him a place to hang his head until he recuperates. While Thaddeus is healing, he finds that Kung and the other miners are battling against the Beetle Clan, lead by Master Ho (Carl Ng) who has taken control of the town from the Mayor (Cary-Hiroyuki Tagawa). Thaddeus plans to help Kung with the battle against the Beetle Clan. So the idea is not the most original idea within the entire canon of kung fu films. It is also pretty evident that this sequel was made on a much smaller budget than the first film. The blood and gore unleashed in the first film felt more realistic, while the bloodshed in this movie feels more cartoonish. I am not sure if that was intentional or not, but it wouldn't surprise me if it was. No matter what, "The Man With The Iron Fists 2" is still a rocking, solid film. Anybody in dire need of a throwback to the old-school kung fu films will be satisfied here. The fighting choreography is big and wild and brilliantly made. Once again, RZA displays some crazy ideas, but they all serve for the brilliance toward the storyline, and a lot of it is quite fun. RZA delivers a fun performance here, in fact the entire cast feels like they had fun making this. Whether its Tagawa, Nguyen or Ng. I think the entire cast knew that this was all in good fun and they let the cat out of the bag. "The Man With The Iron Fists 2" plays out like a kung-fu film and nothing more. It feels more like a nostalgic homage more than something that completely stands on its own. But who is complaining? Your eyes will be popping out of their sockets and you enjoy blow after blow of this kung-fu extravaganza. Plus, Shang Tsung once again in a kung-fu movie? Yes. Please. Who Played It Best? Jonathon E.
John Wick 2 A GO!